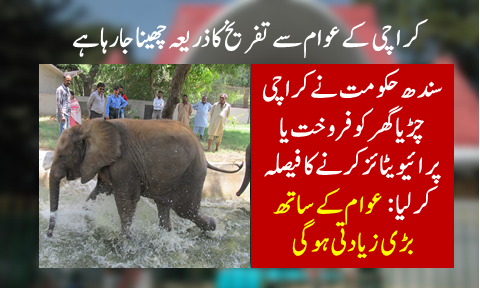 An international firm was handed over the Rs300 million tender to refurbish the Karachi Zoo, The News was informed by Sindh Project Director Niaz Soomro on Thursday. According to Soomro he would be provided the working papers for the project by coming Monday. However, he doubt work on the project could be started soon since chief minister’s orders to remove encroachments from around the zoo were yet to be heeded. Chief Minister Syed Murad Ali Shah, according to the project director, had during a recent visit ordered to do away with the encroachments. Responding to question regarding encroachments posing as potential hurdles for the project, Soomro said it was the administration that should be questioned over it. A temporary room for has been allotted to the firm so they could start their work, he added. The CM had visited the Karachi Zoo on February 1 with the entire team facilitating the revamping of the historical animal establishment; the team includes MPA and architect Samar Ali Khan, design director Zain Mustafa as well as the city mayor, Waseem Akhtar. During an early morning meeting held the next day of his visit, the CM was pitched an idea by both Mustafa and Khan to have the cages dismantled for larger, intelligent enclosures. He was informed by Khan that the innovative designs were based on a research of 10 international zoos including the ones in San Diego, Singapore, Bronx, Berlin and others. The material to be selected for enclosures would be such that required low maintenance, is sustainable and animal-friendly, the MPA added. The ground’s soil would also be changed as per the animal’s physical needs. Apart from that the enclosures were decided to have movable installations, hiding dens, climbing structures and perching surfaces for the animals. The enclosures would have high fences for maximum sunlight, whereas concealed spaces for animals to retire in whenever they required privacy. Veterinarians would also have access to the concealed spaces from the rear end. Murad directed the design team to install CCTV cameras in all enclosures as well as around the zoo for monitoring and security. The CM was told that a topographical survey and an environmental assessment study of the zoo would have to be carried out, on which he asked the planning and development department to use the Karachi package to facilitate the design team.